Summer Day Camps Start June 3rd! SGA Camps promise a great time from drop-off to pick-up! Reserve your spot today! What happens at SGA camps? 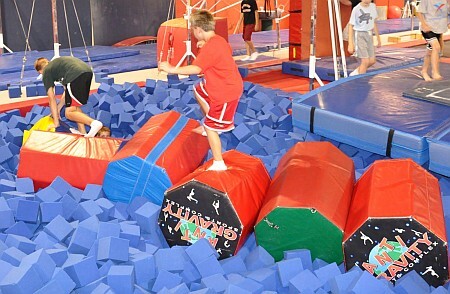 Each child enjoys a fun-filled day of organized games, bouncing on our 5 floor-level trampolines, playing in our large foam block pits, climbing on Mount Southlake, and much more! Our energetic camp leaders keep our campers safe in a 12:1 student to instructor ratio and groups are split by age. Feel free to call, 817-912-1263, with your questions or to reserve a spot for your child. Is SGA camp the same as a gymnastics class? Camp is the not the same as a gymnastics class. Gymnastics classes have smaller student-teacher ratios, are a bit more structured, and the entire class is focused on learning gymnastics. 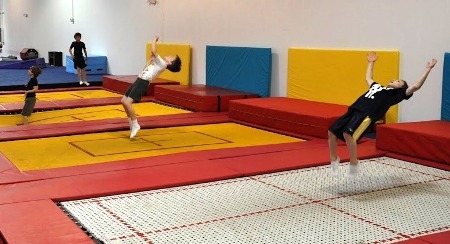 In camp, the children learn some gymnastics, but it is mostly for fun. Gymnastics skills are incorporated into the games the children play and we do a few gymnastics focused 15 minute rotations in each session. We do offer a free trial class if you would like to try a gymnastics class. Who can come to SGA camps? Any child over 3 (must be potty trained). You don't have to be an SGA registered member to attend! Bring your friends and family to experience a day full of fun! Camps run all summer long, over Thanksgiving and Christmas break, and on most other school holidays. Join us for our Summer Day Camps every week day between June 3rd and August 16th, except July 4th. You can come for one session or stay all day! For campers staying all day they can either bring a sack lunch or order a catered "hot meal" from the Mama Bear Cafe in our building. These meals cost $5.00 each. ***You will inform us of your entree choice on arrival the day of the camp. Slots for camp are first-come, first-serve... so make sure you reserve a spot today! You don't want to miss this chance to experience a day your child won't forget!